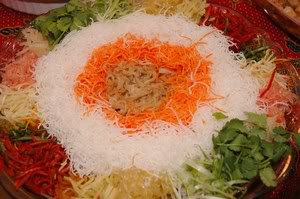 Yee Sang is actually a salad and i am surprised that so many people including asians, do not know or have eaten this dish. Read about it from here. This salad consists of all the tastes and texture to teast your palate and color to please your eyes. Crunchiness is one of them and taro shreds fried until crispy in 2 colors is one of the ingredients. Shred fresh taro with a mandoline and if the taro has been frozen, it would have to sliced thin and then julienned cos the taro will be too soft to pass through the mandoline. Heat enough oil for deep frying and when oil is hot - 350f - deep fry the shreds until crispy. Remove from oil and let it drain. Repeat the deep frying for the green colored taro shreds. When cooled, store in airtight container.